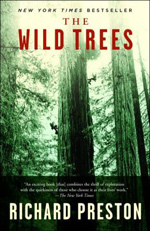 Richard Preston, The Wild Trees: A Story of Passion and Daring (New York: Random House Trade Paperbacks, 2008), 291 p.
From the #1 bestselling author of "The Hot Zone" comes an amazing account of scientific and spiritual passion for the tallest trees in the world, the startling biosystem of the canopy, and those who are committed to the preservation of this astonishing and largely unknown world. Charlton McIlwain, Stephen M Caliendo, Race Appeal: How Candidates Invoke Race in U.S. Political Campaigns (Philadelphia, Pennsylvania: Temple University Press, 2011), 258 p.
In the evolving American political culture, whites and blacks continue to respond very differently to race-based messages and the candidates who use them. Race Appeal examines the use and influence such appeals have on voters in elections for federal office in which one candidate is a member of a minority group. Charlton McIlwain and Stephen Caliendo use various analysis methods to examine candidates who play the race card in political advertisements. They offer a compelling analysis of the construction of verbal and visual racial appeals and how the news media covers campaigns involving candidates of colour. 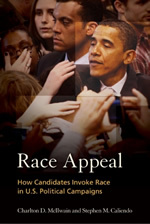 Combining rigorous analyses with in-depth case studies--including an examination of race-based appeals in the historic 2008 presidential election--Race Appeal is a groundbreaking work that represents the most extensive and thorough treatment of race-based appeals in American political campaigns to date. Condoleezza Rice, No Higher Honor: A Memoir of My Years in Washington (London, New York: Simon & Schuster, 2011), 766 p.
With the September 11, 2001 terrorist attacks, Rice found herself at the center of the Administration’s intense efforts to keep America safe. Rice describes the events of that harrowing day – and the tumultuous days after. No day was ever the same. Subsequently, Rice reveals new details of the debates that led to the war in Afghanistan and then Iraq. No Higher Honour takes the reader into secret negotiating rooms where the fates of Israel, the Palestinian Authority, and Lebanon often hung in the balance, and it draws back the curtain on how frighteningly close all-out war loomed in clashes involving Pakistan-India and Russia-Georgia and in East Africa. Surprisingly candid in her appraisals of various Administration colleagues and the hundreds of foreign leaders with whom she dealt, Rice also offers keen insight into how history actually proceeds. In No Higher Honour, she delivers a master class in statecraft – but always in a way that reveals her essential warmth and humility, and her deep reverence for the ideals on which America was founded. Manning Marable, Malcolm X (London, New York: Penguin Books, 2011). Of the figures who tower over twentieth century American history, perhaps none is more complex, more multifaceted than Malcolm X. Constantly rewriting his own story, he became a criminal, a minister, a leader and ultimately an icon, eventually assassinated at the age of thirty-nine. The details of his life have long since calcified into a familiar narrative: his early years as a vagabond in Boston and New York, his conversion to Islam and subsequent rise to prominence as a militant advocate for black rights, his acrimonious split with the Nation of Islam, and finally his violent death at their hands. Yet, this story, told and retold to various ends by writers, historians and filmmakers, captures only a snapshot, a fraction of the man in full. Malcolm X will stand as the definitive work on one of the most important figures in the history of civil rights, surpassing previous treatments in its depth and intensity, and capturing with revelatory clarity a man who constantly strove, in the great American tradition, to remake himself anew. Bruce Western, Punishment and Inequality in America (New York: Russell Sage Foundation, 2006). Over the last thirty years, the prison population in the United States has increased more than sevenfold to over two million people, including vastly disproportionate numbers of minorities and people with little education. For some racial and educational groups, incarceration has become a depressingly regular experience, and prison culture and influence pervade their communities. Almost 60 percent of black male high school drop-outs in their early thirties have spent time in prison. In Punishment and Inequality in America, sociologist Bruce Western explores the recent era of mass incarceration and the serious social and economic consequences it has wrought. 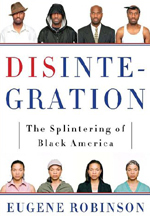 Eugene Robinson, Disintegration: The Splintering of Black America (New York: Doubleday, 2010). Based on his years of reporting and observation of changes in black America, journalist Robinson finds that the black community has evolved to the point where it has disintegrated into distinct sectors: the mainstreamers, or black middle-class majority, who have made tremendous but often understated progress; the abandoned minority with little hope of escaping poverty; transcendental elites of such wealth and power that whites can’t deny; and an emergent group of biracial blacks and recent black immigrants from Africa and the Caribbean who are challenging an essentially native black American experience. In the age of Obama, Robinson notes the advancement of the black elites, with wealth and power, into “full ownership stake” in the U.S., distancing them economically from the middle and lower classes. The emergent group identifies with a different notion of the black experience, making them ideologically and politically unreliable. All are in strong contrast to the abandoned, who are at the center of the black disintegration. Readers don’t have to agree with Robinson’s observations to appreciate the undeniable differences within black America and to maybe want further analysis. Bob Woodward, Obama’s Wars (London & New York: Simon and Schuster, 2010). In Obama's Wars, Bob Woodward provides the most intimate and sweeping portrait yet of the young president as commander in chief. 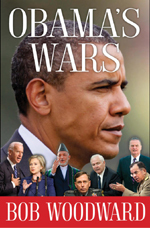 Drawing on internal memos, classified documents, meeting notes and hundreds of hours of interviews with most of the key players, including the president, Woodward tells the inside story of Obama making the critical decisions on the Afghanistan War, the secret campaign in Pakistan and the worldwide fight against terrorism. At the core of Obama's Wars is the unsettled division between the civilian leadership in the White House and the United States military as the president is thwarted in his efforts to craft an exit plan for the Afghanistan War. 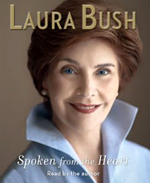 Laura Bush, Spoken from the Heart (New York: Scribner, 2010). According to the Wall Street Journal, "Mrs. Bush's delicate rendering of the virtues and rhythms of mid-century Texas life sets this book far apart from the typical score-settling reminiscences of politicians or their spouses." Indeed, the former First Lady's autobiography is pleasantly--if unsurprisingly, given her famously serene demeanor--mostly free of political spitefulness. However, the critics unanimously declared that this sincere and self-assured memoir appears to be two books masquerading as one: a sentimental and richly detailed account of growing up in small-town America and a lackluster chronicle, "more travelogue and recitation" (Washington Post), of her years in the White House. Thoughtfully and elegantly written, Spoken From the Heart lovingly evokes Bush's beloved Texas even if it adds nothing new to readers' understanding of her husband's presidency. 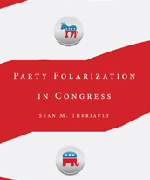 Sean M. Theriault, Party Polarization in Congress. (New York: Cambridge University Press, 2008). The political parties in Congress are as polarized as they have been in 100 years. This book examines more than 30 years of congressional history to understand how it is that the Democrats and Republicans on Capitol Hill have become so divided. It finds that two steps were critical for this development. First, the respective parties' constituencies became more politically and ideologically aligned. Second, members, in turn, ceded more power to their party leaders, who implemented procedures more frequently and with greater consequence. 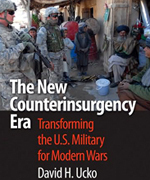 David H. Ucko, The New Counterinsurgency. Trasforming the U.S. Military for Modern Wars. (Washington D.C.: Georgetown University Press, 2009). Perhaps the most important attribute of a successful armed force is the ability to adapt rapidly during war. David Ucko describes how the U.S. Army and Marine Corps adapted to insurgency and, more importantly, why and whether those adaptations are likely to stick. This is required reading for those guiding the future of the Armed Forces.